Alan Moyzis provided this photo of CAP 2-7-2 taken near the end of its existence … maybe as late as April, 1971. The only man remaining from earlier group photos is Casey “Country” Roach who is third from the right in the back row. Moyzis is wearing a jungle hat and kneeling third from the left in the middle row. 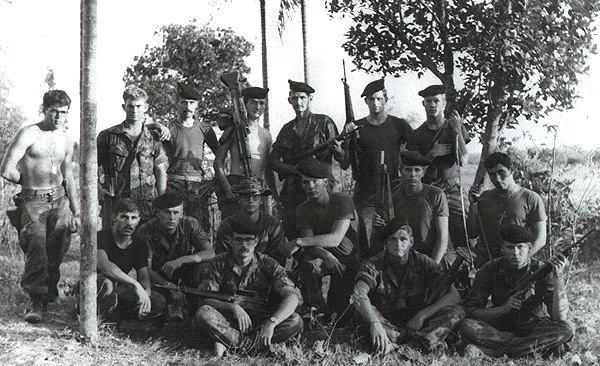 Neale Wright is sitting on the far right in the front row holding an M-16. To the left of Wright is Ray Nischke cradling an M-79 grenade launcher with his left arm. Mike “Frenchy” Wilson is kneeling on one knee on the left end of the front row. The others are unidentified. Former CAP Marines viewing this photo are puzzled by the number of men shown (16) and the berets worn by 11 of them. CAPs were typically short-handed during the last few months of the program, sometimes making do with eight Marines. So this photo may actually show two CAPs. And berets were never authorized headgear, but Alan remembers wearing them with CAP badges attached.